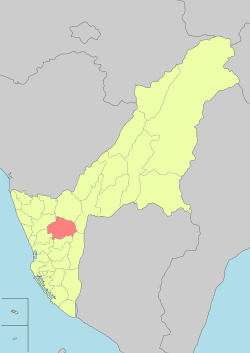 Yanchao District (Chinese: 燕巢區; pinyin: Yàncháo Qū; Wade–Giles: Yen4-ch'ao2 Ch'ü1) is a suburban district of Kaohsiung City, Taiwan. The district consists of Jianshan, Qionglin, Anzhao, Jiaoxiu, Fengxiong, Jinshan, Tungyan, Nanyan, Xiyan, Hengshan and Shenshui Village. Wikimedia Commons has media related to Yanchao District, Kaohsiung.